Editing is, arguably, the most challenging aspect of the writing process. It is a task often feared by young authors. The daunting thought of tearing their precious words apart is enough to cause them to set their work aside forever. However, editing is the key to creating an enticing, well-written short story or novel. 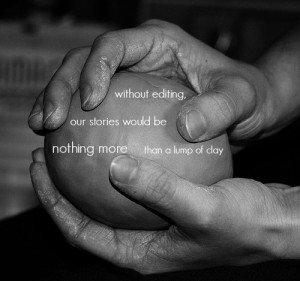 Without editing, our stories would be nothing more than lumps of clay. Below are eight tips to help ease the burden, and help you edit your short story or novel. #1 – Start with broad ideas. For many writers, the first decision they make while editing is to reconstruct each sentence. What these authors don’t realize is how this will hinder them later in the process. By focusing on small details, they overlook the larger picture their story paints. Their eyes skim over the major errors in their work, such as conflicting scenes and plot lines. These broad issues will pop up later, rearing their gruesome heads and destroying the remainder of the short story or novel unless dealt with prior to worrying about sentences and words. #2 – Don’t be afraid of honest feedback. The thought of negative reviews causes quivers of fear to run down the spines of many young authors. However, it is one of the best ways to discover what needs to be adjusted in your story. Once your manuscript is complete, ask a close friend or family member to read your work. Ask them to tell you where the story gets confusing or boring. #3 – Keep your characters consistent. This seems like an obvious statement. However, maintaining the personalities of your characters throughout the entire story can be tricky. There may have been some scenes where you unknowingly altered their thoughts and actions to suit the situation. The editing phase is the ideal opportunity to fix these slip-ups. Action and personality changes break up the flow of your piece and are cause for confusion in the readers. Without consistency in your characters, how will others connect to your story? #4 – Stick to said. Despite what you may have been taught in school, choosing the word “said” over other dialogue tags improves your writing. By using other dialogue tags, you break one of the most important rules in writing—you tell instead of show. Descriptions are often not included when other tags are used. Many writers feel they are unnecessary, assuming the dialogue tags do all of the work. However, this is not the case. “Said” leaves room for the writer to infuse the story with realistic emotions and make the piece a more enjoyable read. In the words of Mark Twain, “Adverbs are the tools of lazy writers.” When adverbs are added to a story, they do not supply complex thoughts or deepen the storyline. In fact, they do the opposite. Adverbs weaken your sentences by slowing down your story and, again, telling instead of showing. In most scenarios, it is best to edit adverbs out of your story. #6 – Eliminate unnecessary words. Let’s face it—writers love words. Sometimes, we love them a little too much and are afraid to cut them out of our stories. However, unnecessary words slow the plot down and have the ability to make stories feel like a trudge through the desert. Eliminating unnecessary words allows the focus to remain on the plot and characters. Example: Laura’s fist draft of Polly Wants to Be a Writer was 71,059 words. When working on her second draft she, “cut everything that didn’t serve the plot and theme” (213, Polly Wants to Be a Writer). Her second draft ended up being only 57,791. #7 – Read out loud. Although it may seem childish, reading your story out loud will allow you to catch any flaws in the flow of your words. Your eyes are more likely to notice misspellings or grammatical errors if your tongue moves at the same pace. For some authors, it helps to read to another person. The listener can help find any issues in the story you may overlook on your own. #8 – Take your time. Hi! I’m also a high school writer, and I’ve just finished working on my latest book. I see that you’ve published several books of your own, and I’m hoping to do the same with mine sometime in the future. Do you have any tips? Thanks!